As the Milky Way was growing, taking shape, and minding its own business around 10 billion years ago, it suffered a massive head-on collision with another, smaller galaxy. That cosmic cataclysm changed the Milky Way’s structure forever, shaping the thick spirals that spin out from the supermassive black hole at the galaxy’s core. Two new studies — one published earlier this month, another still under peer review — describe the evidence for this previously unnoticed event. To uncover evidence of the collision so many eons later, astronomers have to work like galactic archaeologists, sifting through myriad sources of surviving information to piece together a story consistent with the available evidence. Both research teams relied on data from the European Space Agency’s Gaia space telescope, which has spent years gathering exceptionally rich biographies of millions of stars — not only their locations and motions, but for many, their brightnesses, temperatures, ages and composition as well. They essentially created high-resolution and multidimensional maps of the Milky Way and used these maps to find anomalous populations of old stars that appear to retain a memory of the long-ago collision. “The Gaia results really are allowing us to see things in the galaxy that we maybe suspected were there but haven’t seen,” said Kathryn Johnston, an astrophysicist at Columbia University. He and his team found a large number of stars that aren’t moving in step with the galaxy’s rotation. Instead, they move in radial orbits, streaming toward or away from the center of the galaxy. These stars are also rich in “metals” — the catch-all description astronomers give to any element heavier than hydrogen, helium or lithium. Metal-rich stars likely descend from many previous generations of stars. They’re the scions of stars from a long-ago galaxy that smacked into the Milky Way, their orbits still reflecting the odd trajectory of that cosmic agitator. “If you throw a stone in a pond, those ripples last for a while. In an analogous way, if you shake the Milky Way disk, even billions of years ago, it can take a while for that response to settle down,” said Johnston. Belokurov’s group also modeled different collision scenarios, as well as a possible quieter history without significant collisions. An impact of a small “dwarf” galaxy indeed could have deposited a cloud of stars like the ones seen today, they found. Their work was published online earlier this month in the Monthly Notices of the Royal Astronomical Society. The other group, led by Amina Helmi, an astronomer at the University of Groningen in the Netherlands, based its study on a newer, larger data set from Gaia and included a more detailed analysis of the chemical properties of the stars. The abundance of iron, produced by supernova explosions, relative to elements like magnesium, generated by massive yet short-lived stars, yields clues about the history of the galaxy up until the present day. Helmi and her team used this data to conclude that the Milky Way’s inner region contains hints of debris from an ancient galactic impact. They named this ancient galaxy Gaia-Enceladus. The collision could help resolve a longstanding question about the structure of the Milky Way. The galaxy’s spiral disk of stars is actually made of two parts: a thinner, denser region encompassed by a thicker, more diffuse region. Astronomers aren’t sure how this thick disk came about. Perhaps those stars came from another galaxy, or they’re stars from the thin disk that have interacted with one another and migrated outward over time. Helmi and Belokurov’s work suggests that instead, the Gaia-Enceladus collision ejected thin-disk stars out into the thick disk. 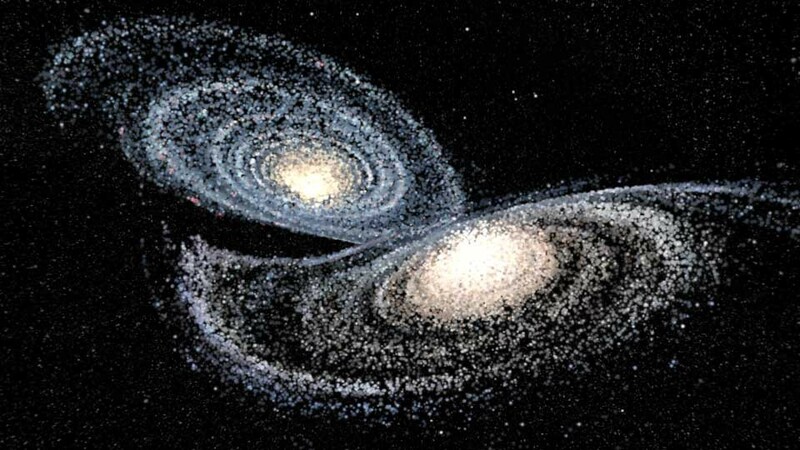 “If this collision happened to the young Milky Way, then it would damage the stellar disk, smash it up, and send stars up to high galactic heights,” Belokurov said. Updated version of the previous article. This article was reprinted on Wired.com.